As I write this, I’ve just returned to my room at Mount Hermon Christian Conference Center. I was one of the speakers at a family camp all week and tonight was the final night. As is the tradition here, we ended by singing and sharing testimonies around the campfire and then it was time for communion. And what blew me away, because I wasn’t expecting it, was the variety of reactions I saw. One by one they came, and one by one I watched. Some seemed impatient, rushing through the ritual. Some actually looked bored. Some seemed to be barely holding back laughter — maybe nervous, maybe mocking, maybe giddy with joy. Some had tears streaming down their faces. Some paused, closed their eyes, and whispered in prayer, “Thank you.” I don’t think they were thanking me. Others stared for a long time at the elements and seemed deep in thought before they partook. As time went on, more people were crying, and I mean actually sobbing: the back-of-the-line people. Maybe that’s because they had more time to think about it. But I think it had to do with the time it took them to get up and get in line. I think some of them were reluctant, maybe thinking they were unworthy, and then finally decided in a deeply personal cathartic moment that they would receive communion after all. And perhaps thinking of a specific sin that they had been seeing as an obstacle just a moment before, now they remembered it was washed away, and they cried. As the line thinned I looked and saw an older disabled woman still seated in the last row, so the other pastor and I marched down the aisle to her with the elements and as she received them she was wide-eyed with gratitude. Then I saw a young man near her who had not come down the aisle and offered him communion but he firmly declined. He comes to each of us, the Lamb slain for us, one by one, and He sees not a mass of humanity but each face, each person, each soul, intimately. And just like at the cross — still 2,000 years later — some laugh, some weep, some look the other way. 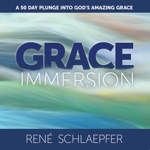 So it is with grace, the word we use to describe the reason and the result of that sacrifice. You might think you’ve heard it all before. You might be bored, maybe impatient. But look at that old man in line behind you. You recognize him. The great intellectual, the Apostle of Grace, Paul. I hope you never feel like you have it all figured out. I hope you linger as you gaze at the price paid for you. Think of the love felt for you. Consider the sins washed from you. And become simply amazed by grace! 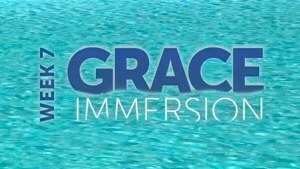 Buy Grace Immerison at Amazon.com or in person at Twin Lakes Church.